The HTC Re Camera is a strange creation unlike anything else we’ve seen: it’s not an action cam like a GoPro, and it’s also very far away from a traditional camera. HTC calls the Re a ‘lifestyle cam’, implying that it has the style and durability to be with you in all sorts of situations - you can equally well use it in the gym, and at official events like a wedding. The Re is indeed something that is easy to carry in your pocket, a strange little thing that resembles an elbow of a pipe, an inhaler, a periscope, or who knows what else, but not a traditional camera. This unorthodox appearance is further boosted by the lack of a viewfinder, something that makes the HTC Re a very impromptu camera experience and a bit strange to operate at first. With its peculiar looks and some added features like the light waterproofing, this unique little cam has definitely gotten our attention. Let’s find out if it’s really any good. The peculiar form of the Re Camera is comfortable to hold and allows you to experiment and shoot from up high and down below. 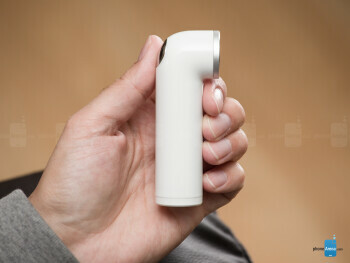 It is the form of the Re Camera that gets instantly noticed - shaped like an inhaler, this little cam stands out among all other cameras out there. In terms of color and material, the Re comes in a choice of four fresh colors - white, red, blue, and green, and they all sport a glossy finish. 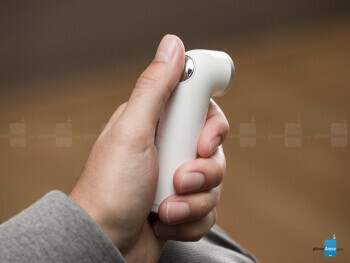 It has a large, one-step shutter button on the back that falls right where your thumb resides. The button is clicky and comfortable to press, something particularly important when you don’t have a viewfinder and that click is the only thing that reassures you that you’ve indeed taken a picture (hold it if you want to record video). There is just one more button, and it acts as a trigger - hold it to activate slow motion video. There are also two LED lights - one on the back, integrated in the shutter key, and another one on the front. The LEDs light up once when you take a picture, while when in video, the light from them will blink (yellow for pictures and regular videо, and blue if it’s a slow-motion video). Then, you have two microphones, one on top of the camera and another at the front. You charge the Re via a 5-pin microUSB port located on the bottom of the shooter, where there is also a flap-protected microSD card slot, and a tripod mount. You also should not worry about getting your Re camera wet - it comes with an IPX7 certification, meaning that you can submerge in water up to 3 feet (1 meter) deep for as long as 30 minutes. HTC is also selling a waterproof cap that bumps up Re’s waterproof rating to IPX8, allowing you to dip in up to 10 feet (3 meters) for as long as two hours. The companion app connects to the Re with Wi-Fi Direct and it is not instantaneous in displaying photos. You also use it to adjust the camera’s settings. The companion app is an essential part of the Re experience and it’s something that is missing on rival products like the Polaroid Cube, for instance. It’s a free download on iOS and the Google Play Store (requiring iOS 6 and higher, or Android 4.3 and newer), and has a fairly simple interface that gets the job done with no bells and whistles. What’s the job? With a built-in wireless (Wi-Fi 802.11b/g/n) module, the Re creates an ad-hoc wireless network (Wi-Fi Direct) with your smartphone, and transfers images and videos quickly (but not instantaneously). With a microSD card slot, it's up to you to specify the amount of storage. A nice option to help you manage photos easier is the automatic deletion of images upon transfer to the _phone_ via the Re companion app (this option is turned off by default, you turn it on in the app). The Re captures images of good, but not great quality: it lacks in detail, and colors appear a bit washed out. 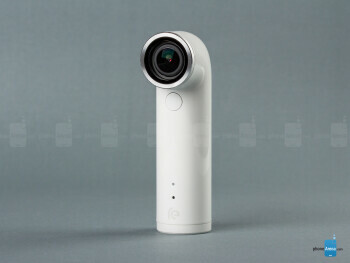 Before discussing the actual quality of photographs and video recording on the HTC Re camera, let’s look at the technicalities. The Re comes with a fixed-focus camera, and that’s important. It means that everything that is not extremely up close (forget about macros) will be in focus on images. It also results in images that lack that ‘shallowness' in the depth of field, and instead look very flat. Digging deeper, we see a 16-megapixel 1/2.3-inch Sony CMOS sensor (the same size as the sensor in the Sony Xperia Z1/2/3, the biggest one in Android land), and that works out to a pixel pitch of 1.34 microns. That is more than the current trend of 1.1-micron pixels in flagship smartphones, and theoretically, this is good news for low-light photo shooters. On top of that sensor is a 146-degree ultra-wide angle lens with an aperture of f/2.8. Speaking in 35mm equivalents, the lens has a focal length of 17mm, quite the wide-angle shooter compared to smartphone cameras like the 31mm on the Note 4 and the 29mm on the iPhone 6. There aren’t many controls on the Re itself: pressing the one-way shutter key shoots a picture, and long-pressing it records video (4x slow motion if you have pushed the front trigger button). You can also shoot time lapses, but for that you’d need to go into the companion app. What we love about the Re camera is how inconspicuous it is. You can turn off shutter sound altogether (by default, you have a ‘loud’ sound, and you can also switch to a quieter, ‘soft’ one). The image quality out of the HTC Re Camera is decent, but if you obsess over image quality, you’d notice quite a few issues with it. It falls short of the main camera in current flagship smartphones like the Apple iPhone 6 and the Samsung Galaxy Note 4 that we compared it with. The 16-megapixel image stills come with colors that appear a bit dull, and detail rendition is below average - everything looks smudgy and there are very noticeable sharpening halo artifacts, and this applies even in photos taken outdoors. The very wide-angle lens also introduces barrel distortion, noticeable even in more central parts of the image. Go indoors and in lower-lit environments, and taking a sharp image becomes particularly hard - shooting blindfolded without any viewfinder you end up with a lot of very blurry, unusable photos. Noise is also an issue in lower-lit situations, and if the light is scarce it often makes no sense to use the Re camera as image don’t turn out very well. Keep in mind that those are the impressions that you get after comparing the Re with the main cameras of smartphones, but given that a big part of the Re’s suggested use is for selfies, we should say that the selfies that you can capture with it are much, much better-looking than what you can shoot with the front-facing camera of any smartphone. You record video just as easily and quickly as you snap photos on the Re - just hold the shutter key for a second and recording starts. You can record 1080p or 720p video at 30fps on the Re camera, but you cannot take still images while recording video. Again, it is the simplicity of use - just tuck the Re in your front shirt pocket to use it as a lifelogging camera, or simply hold it down to record your kids or pets - that adds a lot of new perspectives with this little cam. In terms of pure quality, though, we’ve seen better. Detail is noticeably soft and colors again appear a bit lacking in richness and toned down. For time lapses, the camera takes 16-megapixel images at pre-set intervals of time (you can manually adjust how long the time-lapse is going to be and how often the Re is to snap images), and the only way to start and configure a timelapse is via the companion app. Slow motion videos are recorded at 720p and 120fps, making for a 4x slow-down of action. On a more positive note, the digital stabilization in the Re camera does a very good job. We compared it against the Note 4’s camera that features optical stabilization, and found the digital one in the Re to yield more stable videos. The 720p option is nice to have in case you want to record more than an hour of video as it takes up less space, and with the right accessory, you can use HTC’s lifestyle cam as a dashboard cam. Audio recording lacks clarity and sounds very hissy. It’s a mono stream recorded at 48KHz and 180kbps, which in itself is technically sufficient, but it seems that the actual mic is not doing a good job. If you’ve got a kid or a pet, you’ll appreciate how easy it is to shoot down low, and you can also shoot from up above you for a new perspective on your environment. Overall, the Re fits comfortably in the hand, and it’s reassuring how you can have a tight grip on it. This form might seem like a superficial feature, but it’s about much more than just the looks. Having such a comfortable hold on a camera means that you can use it from all sorts of different angles that would be a pain to shoot in with other, more traditional cameras. An overhead shot? The Re makes that easy. Shoot close to the ground (particularly useful for taking pictures or video of pets and kids)? Not a problem. The biggest highlight, however, is the lack of a viewfinder and a power button, meaning you don’t have to wait for the camera to start and then stare into a tiny viewfinder, thus wasting precious time to carefully compose your shot. With a built-in grip sensor that smartly automatically turns the Re on when you hold it, HTC has managed to do away with the power key. When it comes to the lack of a viewfinder, you still frame approximately with your eyes, but if you really need to see what it is exactly that you take a picture of, you can do so using the companion app and your smartphone as a viewfinder. We tried that, but most of the time ended up not bothering with the app. It’s surprising just how liberating the lack of a viewfinder can be. It took us a little while to get accustomed to the fact that you just take out the Re and shoot away, but after that short period, we found ourselves snapping a ton of images, multiple times more than we’d do with a regular camera. With the convenience of this form factor for selfies, we can honestly say that in an hour with the Re, we snapped more selfies than we have ever snapped in a lifetime. The Re camera is powered by an 820mAh battery, that HTC claims can last you enough time to snap as much as 1200 photos or around 1 hour 50 minutes of 1080p video. We found the 2-hour longevity claim to be about right, and for us that felt a bit limiting. 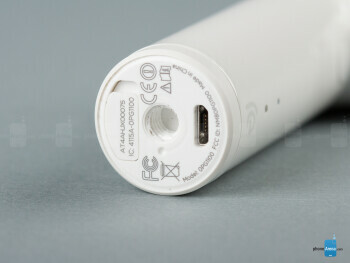 We should also note that the battery is not user-removable. The Re camera is compatible with all tripods as it has a standard camera mount, but HTC has also announced plans to release several accessories for the RE camera: an adjustable clamp, a charging stand, a universal mounting stand, universal wall plug (charger), portable battery, and dual-port adapter. 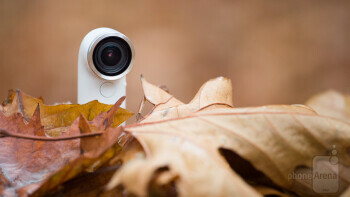 The HTC Re Camera is a strange little shooter that has a fun and appealing style. However, it also has a steep price tag of $200, nearly double the price of rival action cams like the Polaroid Cube ($100), and the GoPro Hero ($130). 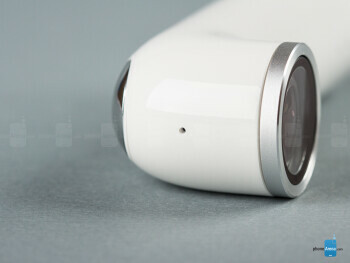 HTC is trying to position the Re as something a bit different than an action cam, though. It’s calling the Re a lifestyle camera, something you can use similarly well during your run or workout, and when you’re out with friends. And, with a convenient form factor, you have more possibilities to shoot from different angles and positions. However, the Re falls short when it comes to pure photo and video quality with soft detail and slightly dull colors. Images captured with it are not necessarily bad, but they are not great either, and we’d expect a bit more from a $200 cam.